I gave the name of "The Sower's Strategy" or "The Sower's Way" to the idea that we should use our remaining fossil resources to build the renewable energy infrastructure needed to replace them. The calculations by myself, Sgouridis and Csala show that it can be done: after all, this is what our farmer ancestors did when they saved some of the crops of the current harvest as seed for the next harvest. For some reason, the idea that we should wisely invest the energy we have, while we still have it, seems to be incomprehensible to some people who maintain that fossil fuels are evil (which is true) and that for this reason anything you can make with fossil energy is evil, too, including renewables (which is not true). So, the penetration of the "Sower's meme" has been modest, up to now. But from a recent trip of mine to Norway, I noted that the Norwegians put this strategy into practice, even though they probably never heard of the name I gave to it! Right now, Norway produces about 100% of its electrical power from renewable sources, mainly hydroelectric power. About one-third of all vehicles bought today in Norway are electric, a continuously growing fraction, with a total of about 13%. Adding the plug-in hybrid vehicles, we get a grand total of 24% of the circulating vehicles. 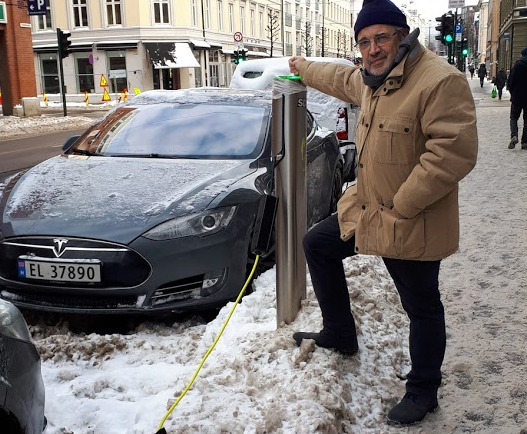 It seems reasonable that it will be possible to achieve the target of 100% of electric vehicles in Norway by 2025. The Norwegian system is not yet 100% renewable power as a fraction of the total consumption, it is at present around 60%, but it is already a great result if compared with that of other countries: the UK, with a similar climate as Norway, lags behind with less than 9%. Italy, with all the sun it has, doesn't do better than about 16%. So, Norway is well placed to be the first developed country in the world to achieve the great transition to a fully renewable energy system. There remains a lot to do, of course: after having eliminated fossil powered cars, the internal heating of buildings needs to be electrified -- it is possible. Then, there is a need to reduce plastic use, not counted as energy consumption but still a product of fossil fuels -- also that can be done. Finally, there is the issue of agriculture, right now completely based on fossil fuels. The challenge is difficult, but not impossible. Electric machinery can replace diesel powered machines in agriculture, while the Norwegians are well placed to develop the manufacturing of fertilizers using electric power, bypassing the cumbersome and polluting Bosch-Haber process (look at the site of N2-Applied, it can be done!). Surely, you may say, it has been easy for the Norwegians: they have made so much money with selling oil! Not so obvious: think of Saudi Arabia, they made even more money with their oil and do you know what fraction of their energy consumption comes from renewable sources? 0.01% according to the World Bank! Apparently, it is not enough to be rich in order to be wise -- but that seems to be part of the way the universe works. 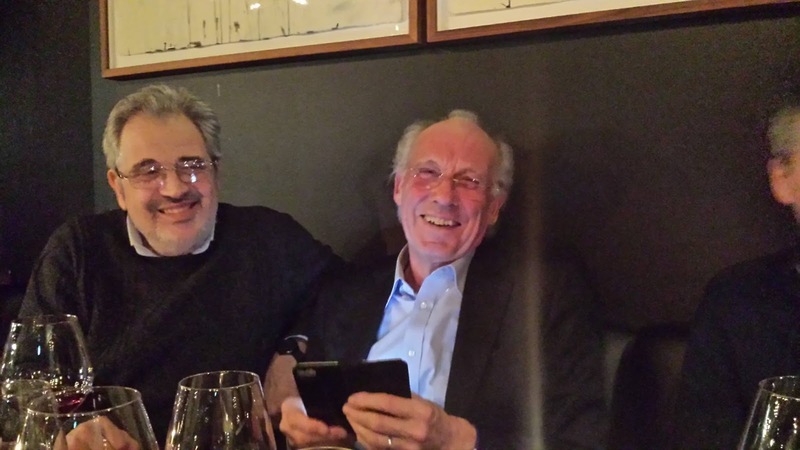 To finish this post, here is me (Ugo Bardi - left in the picture) in Norway, together with Jorgen Randers (right in the picture), one of the authors of the first "Limits to Growth" report of 1972. As you can see, we catastrophists are not sad! Fairly easily doable for Norway... much less so for nearly everyone else on this planet. It would have been easy for the Saudis.... and even for us, if just we had wanted to do that. Now, though, we are damned if we do and damned if we don't. There is no easy and comfortable way out of the pit that we have dug for ourselves. Something is going to give and nobody will be pleased when it happens. Yes, but the more we do now, the less narrow the bottleneck will be later. We are either at or on the brink of cascading effects of industrial civilization. The pollution is killing millions a year and increasing. The 6th mass extinction is well underway. The climate crisis is threatening all life on the planet so...no I don't think we can or should crank up industrial civilization to 11 and build out a dream world. It sounds nice though. I am certain there are a few small pockets that can and will dance as fast as they can to create their own little utopia but there is zero chance that a large % of the population can accomplish this therefore in my mind it is not a positive thing. It is way too late to propose sustainability, renewable infrastructure, EVs, etc. If we keep focusing on all of these tiny efforts and simply add them into our existing society even at a rapid rate many, many people will die. Maybe 10% of the population could afford this as the resources for scaling are simply not there (as I am sure you know). What we must do first and foremost is LESS! Like 80% less. Pull back and have the focus be entirely on making sure everyone is ok. Everyone and I mean everyone has a place to live, enough to eat, cloths to wear, and access to information. Then society becomes focused on education, everyone has unlimited access and things like liberal arts, humanities, art and science, earth science, etc. are emphasized. Obviously things still need to get done and they will but much more locally and regionally and everyone will be involved as it will be done with less energy, more labor. This is not a communist hell that I am sure many will conjure up, it can be done in an environment that is much less insecure and anguish fill than existing society. Nature has an amazing ability to regenerate if left alone and that is what we need to do right away. We can do all this while talking about regrouping and restructuring civilization in a safe and sane way for a very hopeful future, a truly hopeful future not a magical pulled out of magical thinking. There is obviously a place for EVs and solar panels in this scenario but they do not solve anything and allow us to continue living as we do. In my view we either go in this direction and promote common good and humanity or we go the opposite way of division, hate, violence, and death. Jeff, I am afraid that you are completely, absolutely, desperately, hopelessly wrong. 7.6 billion people existing today are a consequence of the fact that there exists a flow of some 17 TW of energy in the system that makes their life possible. Reduce that flow significantly, and you kill off billions of people - fast. I assume that you don't understand this, because otherwise you would be evil and I am sure you are not. But that's the consequence of all the proposals that would have us go through the Seneca cliff without any mitigation coming from renewable energy. energy capturing infrastructure and energy-using devices have to be rebuilt after 30 to 50 years. to cause eutrophication of rivers,vast ocean dead zones,and nitrous oxide atmospheric pollution,which increases the greenhouse effect,whether it is made via the Haber-Bosch process or other method. It is also called "riding the tiger"
Ugo - You are conveniently miss representing the situation to support your conclusion. You know perfectly well that only 10% of the population are consuming well over half that 17TW so there is plenty of room to do less. If everyone lived like the average American we need 5 earths, if they all live "green" only 4.5 earths. If everyone lived like the average Indian we only need .6 earths, add in some internet and sanitation and we are up to .9 earths. It is doable but those in the 10% will never let that happen so "green" it is and all the violence and death that it guarantees. That's exactly my point, Jeff. We'll never see the 10% renouncing to even a tenth of a percentage point of what they have -- not even the civilized Norwegians will do that. That's morally and ethically bad, but it is the way things are. So, we need to maintain the pie as large as it is, but make it renewable. If the pie shrinks, those people who have the smaller slices will starve. Agricultural use of exergy is only a pretty small part. So mankind can easily slash its exergy use radically while keeping agriculture working. Small, but fundamental if you need to eat! Jef Jelton. Please try to understand the scale of human population. Tokyo metro area has 40 million people for example. It took a century of embodied energy use for humanity to overgrow to it's current size. It may take another century guided by newly woke mass sapience to devolve the system back to a permaculture existence. We must use the current energy wealth to build a clean energy bridge to buy the time to bend back down humanely. Everything will have to change and find a whole new way. "there exists a flow of some 17 TW of energy in the system that makes their life possible. Reduce that flow significantly, and you kill off billions of people - fast." - The energy flow will slow, soon, abruptly, no matter what. We're at or very close to peak oil. So-called renewable technologies can't scale to fill the depletion if those in the overdeveloped world indulge in the same lifestyles as ever. - Every day we keep industrialism going, we degrade water, soil, air, biodiversity, and climate stability; thus decreasing carrying capacity for millions of years to come. - Every day we keep industrialism going, we add 227,000 net new humans to the earth. We're accelerating towards an inevitable crash. Each day we refuse to hit the brakes is a needless, pointless murder of another 227,000+ humans (plus countless non-humans.) And as Jeff points out, we can pursue degrowth while attending to human rights and justice. We'd have the least disastrous transition with an 80% cutback by those disproportionately consuming the earth, paired with judicial deployment of fossil-fuel derived bridge technologies for public service (*not* for personal vehicles and consumer society unlimited wants). A lot of this comes down to where one's loyalties lie: to an industrial system and lifestyle which should be continued at literally any cost, or to the actual needs of actual people. "Reduce that flow significantly, and you kill off billions of people.."
This is a very bizarre assignation of Agency. "We" (EV critics) are not going to kill off billions of people, our unavoidable upcoming reduction in energy flow will. This is the entire premise of the Limits to Growth and of the Peak Oil narrative. Refusing to accept the ramifications of these concepts seems odd to me, at this late date, and to "blame the messengers", as it were, seems just like what all the climate-change and peak-oil denialists are prone to do. Building EVs and solar installations **will only reduce the energy flow faster than would otherwise occur**, as these are one-time stop-gaps of a few years' duration for a limited clientele, and completely underpinned by the fossil-fuel infrastructure, to boot. But that's ok, because that's as predicted by thermodynamics: we are programmed to dissipate the max. amt. of energy possible (MPP/MEPP principles), and EVs (in addition to writing books about them, as well as typing electronic comments about them) fit right into that maximum-throughput waste paradigm. You tell me what you want to do and I'll tell how many billion people will die as a consequence. Doing nothing means at least 5 billion deaths in a short time. Replacing fossil fuels with renewables, as I propose, means that nobody will starve and that the population curve will gradually decline, adapting to the available resources. There are, of course, many intermediate possibilities and a good nuclear war, that some people, up there, seem to be planning, would have the same effect as some plans proposed by apparently benevolent people. You are operating under the assumption we have Agency in this. There are biophysical forces beyond our control to which we are subject. They are the same forces that are driving you to tout wasteful EVs: the maximum power/empower/entropy production principles [Lotka, Odum, Swenson, and others].. We simply cannot help ourselves. As dissipative structures, we will continue breaking down energy gradients until we can't. The above notwithstanding, you are still not going to have "nobody starve" by "replacing" fossil fuels. The Haber-Bosch process alone has been famously said to account for 40% (now 50% or more?) of the nitrogen in our bodies. Lose that, and you lose far more than half the population right there.. Potentially most of the population, since a population receiving 50% of its needs is not going to have 50% of its members survive, assuming an even distribution.. With an even distribution, 0% will survive because none can exist with 50% of what's necessary. So there you go.. at least 5 billion right off the bat! It's not a question of Doing Something or Doing Nothing: the outcome will be essentially the same. Do you really think that soy will be harvested at scale by electric combines, that materials for batteries will be mined by solar power, that you can build solar-panel fabrication plants out of something other than concrete, or that we can pave the roads with something other than asphalt?.. the list is just too long to enumerate and you already really know the answers to these questions. To conclude, I cannot emphasize enough the very common error of confusing what is, and what will be, with what people "want", "propose", or "plan". Nothing could be further from reality. The fossil-fuel era will end and the nuclear dis-containment era will begin, the majority if not all humans will die in a not-very-distant future, and the path of these developments is—to my mind—as clear and predictable and traceable as the trajectory of a bullet once it leaves the barrel of a gun. It seems that the Sower's Strategy is the least bad option available. 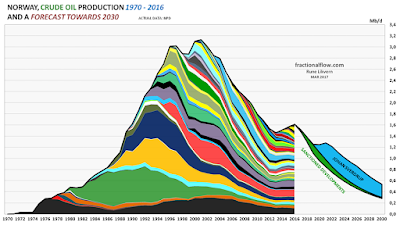 Its weak point is that even if we utilize our currently available fossil resources to construct vast amounts of renewable infrastructure, the problem will recur when in 30-50 years this infrastructure comes to the end of its productive life. By that time, there won't be sufficient fossil energy resources to replace all this. Renewables seem to be more of a fossil fuel extender rather than a replacement. Failure to implement the Sower's Strategy, as you indicate will "kill off billions of people - fast." Implementing it however will kill off billions of people - not quite so fast; it may stretch the overall population decrease by some decades, but I don't see a population of anywhere near 7.6 billion a hundred years from now. Antonietta, I am sorry that you are just as wrong, completely, absolutely, definitely, totally, as Jeff is. Can't you see that renewables have today an energy return that allows to replace them at their end of life? It is not complicated, it is called having an EROI>>1. It is just a question of reading the right sources and tell what they deserve to be told to the people who continue blabbing about renewables being an "extender" -- they are much more than that. So Japan collapsed because the external forces of economic growth were stronger than the internal forces of non-growth. Thus a weaker paradigm was replaced with a stronger one. Now we are supposed to successfully return a much weaker paradigm, peacefully, without WW3? What is different today, what enables us to switch to being weak? Why didn't we just switch to nuclear power after WW2? The 1945 bombs proved that nuclear energy has huge power. Why should renewables suddenly be much more successful? They seem much weaker to me than nuclear power. Have you ever heard of a renewable bomb? What will happen to all those cooling ponds and tons of plutonium when civilization stops growing, that is, collapses? Supplying our current energy usage with renewables is very close to impossible. If you disagree, I suggest you try to research the issue like I did when I was trying to find a feasible way to avoid collapse. There are physical, technical and political reasons for the wind and the solar not being The Solution that is going to save us. Our only "option" is to reduce our use of energy (and other resources) to a small fraction what it is today. The human population will be reduced. A lot. It won't be pretty. An EROEI over 1 just won't cut it. Go to 1:27 or check this video page.. 21 min. "If you're on an island in the ocean and your only energy comes from one oil well, and if you get an EROI of 1.1: 1 (that's about what we get with alcohol fuel maybe, from corn. If you get 1.1:1 you can pump the oil out of the ground and put it in a tank and look at it. If you have a 1.2 : 1, you can pump it out of the ground, *refine it*, and put it in a tank and look at it. 1.3:1, then you pump it out and refine it and ship it to where you want to use it and look at it—you can't use it. If you want to drive a truck, and this including the energy to make and maintain the truck and the energy to make and maintain the roads and bridges and so forth, then you've got to have at least 3:1. But you can't put anything in the truck. So if you want to put something in the truck, like grain.. so you've got to grow the grain and so forth, that might cost you 5:1, you know, to do that.. and if you, so that includes the depreciation of the truck, but if you want to include the depreciation of the oil worker, the farmer, the guy who maintains the bridges and everything.. then you've got to have something higher.. we haven't done real precise calculations on it, but something like 7:1. If you want to educate the kids, 8 or 9.. oh, if you're going to include the families, you've got to deal with the depreciation of the famillies to replace the workers, so that kicks it up to -where are were?- 7 or 8 to 1, if you want to educate the kids 8 or 9 to 1, if you want to send them to MacGill, maybe 11 o 12:1, and if you want medical care, 13-14:1, you want a symphony, 15-16:1... and so forth so, you know, what do you want? And who's gonna get it? So, we think these issues bring a lot of focus on the issue of how do we slice the pie?, because it looks to us, in much of Western society, the pie isn't going to get much bigger." Full of sound and fury and signifying nothing. I agree totally with Jeff. As a conservation biologist, I see only too well the damage our industrialized culture is wreaking on the other life systems of the planet (on which we depend). Plus internet and urbanization, is distancing us from the real world on which we depend for our existence (and we seem totally unaware of that salutary fact). The real issue is that the last 100 years has been a fantastic party - best ever held on earth - but unfortunately the party is over. Read Vaclav Smil (on the realities of operating our culture on renewable energy). I live as much as possible on solar - but the realities require me to fire up the fossil fueled generator whenever there isn't enough solar (which at this time of year is often). We forget that nature is profligate - which also means she wastes what is "surplus to requirements" - and sadly, that applies to us - even if we'd rather that wasn't the case. Sadly billions of people ARE going to be killed off .. that's reality. You or I could be one of them. We are living way WAY beyond our planetary means. (Read Alice Friedman - Energyskeptic). One big obstacle for renewables comes from misunderstanding of the concept of civilization, the lack of education in humanities. One of the best explanations was given by Arnold Toynbee. Read it. Civilization is based on creative paradigm. Civilization exists until there is enough energy to fuel that particular paradigm. Civilization dies with it's paradigm. No civilization is that flexible to change original paradigm. Since this (industrial) civilization is based on paradigm of unlimited growth it will die when the fuel is spent. The paradigm of this civilization is not possible to change. With new paradigm starts new civilization. That would be some completely new civilization, not the extension of old one. New paradigm requires a new social order, new values, new lifestyle. With respect for all people that comment on this blog, I do not think that we are able and ready to change our life that much. But I understand Ugo's efforts to change dying paradigm. It's impossible for a responsible and intelligent person not to try to save at least something. I can assure all of you that every civilization leaves something to later civilizations. But, as far as our civilization is concerned, it probably won't be solar and EVs. All that every civilization can leave to future generations is some cultural concept, not some particular technology. (Old Greeks produced the best ceramic glazing of them all, but their technology secret died with them. In spite of all spectrometry we can not understand how they did it). As individuals we can not hope to live forever. The same applies to civilizations. As far as Norway is concerned, I can say that Karin Krog is great European jazz singer. "As individuals we can not hope to live forever. The same applies to civilizations" But we want to leave healthy and happy descendants. BTW, what technologies are left as inheritance depends on how bad the crash is. For instance, the black death caused a significant crash in Europe, but no technology was lost. The technology from 14th century was so basic that can be used in any civilization but the technology of industrial civilization is different. You are free to propose solar as solution but keep in mind that powerful corporate interest would gladly accept it if it was feasible. Exxon Mobile has much more influence on global economic and production policies than any university professor. There is enough evidence that Big Oil in USA knew about CO2 emissions causing destructive climate change in the late 60s. They would be the first to propose solar as replacement if that is feasible. They have financial resources for the change just like Rockefelers promoted automobile industry when electricity appeared as replacement for petroleum lamps. They have means and good financial motivation to stay the leaders in energy supply after the fossils are gone. The question is why don't they support it? May be their engineers have some data and models that explain why they don't support it and they don't want to share it with the rest of us. If they know that fossils are disappearing why they don't move their capital in alternatives. I suggest to every reader of this blog to find Lao Tse's story about "The man who despised machine". It's for me the greatest philosophical text ever written. It's very short but completely explains the paradox of technology (and civilization in general). Even the simplest of technologies, if practiced without restrain, can be absolutely destructive. Chinese living 2500 years ago already knew everything there is to know about civilization. Do you see the paradox of industrial civilization? It needs mass of consumers in order to exist at all, but the mass of consumers at the same time cause the death of it by over-exploiting resources. There is no industrial civilization without mass of people, without overpopulation. I made an error. The story I mentioned is by Chuang-Tzu not by Lao Tse. Anyway, it's Taoism. Ugo you write one of the best blogs on the internet and I never miss one. I do think your faith in renewables as a replacement for our beloved carbon fuels is panglossian. Norway as a model for going forward for the rest of us slobs wont work. Norway is unique in the world because its renewable source is almost entirely hydro which is really the queeen of renewables in that it is not intermittent and can function as a baseload power source superior to even fossil baseload plants in that it can be scaled up and down rapidly and hydro generated electricity is 95% efficient unlike pitiful wind and solar. The rest of the world without fjords and dams and ample rain and snowfall aren't so lucky. Norway has the best of both worlds for at least a while longer. Except for a few other countries like Sweden, the Norway miracle wont work. There is no doubt that EV powered transportation with cars, buses and trains getting around a big city or two in tiny Norway can work but pretending Norway is an exportable model is a fond misplaced hope. I am a farmer and there is no way agriculture as currently performed can be replaced with electrons except with certain types of mostly small portable machines. The energy density and energy requirements of most ag equipment cannot be met by electricity beyond say carrying crops on level ground with low rolling resistance wheels. Some countries like the US with vast sprawling road networks and scattered distant subdivisions far distant from work and play are particularly mal positioned to derive their energy requirements from renewable energy. Comparing Saudi Arabia's experience to Norway's' is meaningless as that desert paradise has an impossible climate and only a single resource. Their advanced manufacturing infrastructure couldn't even provide the box cutters used to break into the cockpits by the Saudi hijackers. Technical civilization has no paradigm - it is like water, flowing everywhere the demand of customers is leading. And those customers are slowly slowly changing their mind, demanding more and more ecological energy. Also, the state is a customer as well and can, via taxes and emisstion allowances, modify the demand by modifying the price on emissions. So what we need is a constant conversational change in the direction of sustainability. I see absolutely no contradiction between using less resources and energy and producing them from renewable sources. It is rather just one - necessary - part of an integrated strategy to solve the problem. Concerning Norway, yes, she has several advantages: an extended country with a small population, huge hydropower resources, very rich because of past oil revenues, high education, good governance and sophisticated industry. But other countries have at least some of those advantages, too: America has a comparable low population density, which will allow her to harvest a lot of wind and sun. Same holds for Arabia. In countries like Germany, the situation is less favourable: high population desity, low hydropower resources, rather mediocre solar and wind resources. It will be really difficult for us to match exergy demand with supply, without fossils, and with no good storage system at hand. I have been a follower of your thought since you organised an ASPO Conference in Umbria 2009, (I came on an overnight bus to Italy) and have been a fan of Sgouris Sgouridis since his presentation in Edinburgh in 2013. England trebled its population after 1750 before synthetic fertiliser and well before fossil fuel mechanisation. A new agricultural system had taken in more land, but crucially had sustained ‘natural’ soil fertility and indeed had increased available soil N, in places by as much as a factor of 3. The system, although potentially sustainable, hit its limit around 1850. After that in the face of further trebling of population England and Britain, almost entirely urban by mid-20th C, has relied on large scale net- imported food (calories), not just on modern fossil fuel and cropping on its own acreage. Medical practice also improved greatly in 18th century Britain, reducing infant mortality (and that of mothers) quite significantly - this was discussed by physicians and surgeons at the time. The Nitrogen Cycle has been reasonably described and quantified for a long time. World-wide a certain amount of essential fixed-nitrogen is supplied, and always has been, to the soil-base of the living food chain by lightning discharge which ‘fixes’ atmospheric N2 gas. I found the site you linked disingenuous, although the farmer was sincere. Northern Ireland is full of lovely people. Fact check: (references are available): Bacteria do most of the N2 fixing worldwide, mainly in association with leguminous plants. Thus clover in a mixed agricultural grass sward can fix (in Northern Ireland as it happens) as much as 200kg of N (i.e. fertiliser definition) per hectare per annum, which, to provide a sense of proportion, is about the amount often applied to high-yielding modern grain crops per annum. Manure just moves the N around, often very usefully depending on context. Cutting down the losses of N from manure during process is a good idea. You are the chemist. Evaluation of the kit attached to the farm's manure digester and methane collector could be useful. I have more detailed comments about overall system and wider context, but these would perhaps be better communicated off-line if we mutually have time. I would love you to develop a dialogue privately with Dr Herren and get a discussion going in the Club of Rome. PS. It doesn’t look as those power interconnectors from Norway to Britain will get built. PPS. Question for Anon, do you have links to any bibliography? I didn't know the story of the curate's egg -- fun and very British! About discussing more about N2, write to me at ugo.bardi(swirl) unifi.it, I'll put you in contact with the people of N2-Applied. We need to pool knowledge for a thorough evaluation. Human manure, you mean. Right? Yep. All cities drain soil fertility, especially as urban populations swell and modernise. But I should not have conflated this with drainage from modern agricultural hinterlands: e.g. considerable fraction of fertilizers applied to crops find their way down the Missisipi into the Gulf. Thanks once again to the Cassandra's Legacy readers who responded to the 2019 Collapse Survey! We have currently 648 Respondents, 142 of which come from Cassandra Land. The Survey is still OPEN, so you can still get your opinion counted. We have begun the parsing of the data and analysis, and one of the first things I pulled out was the free answer question on what the Kollapsniks themselves think about collapse. On a qualitative level, it's quite interesting. I am glad to see Ugo vigorously defending his work with Csala and Sgouridis. I am thankful he has the patience and fortitude to consistently restate the position against the flow of nonsense with respect to renewables. (Vaclav Smil appears to be one of the historical sources of nonsense) The importance of updating thinking wrt to renewables cannot be overstated. The sunlight conversion efficiences, tracking and inverter technologies, plus fabrication learnings give an increasingly compelling case for PV. Wind harvesting at low wind speed and improvements in general provide similar comfort wrt to wind power. These two elements alone if coupled with at least an intention to achieve a 1000W society would be sufficient to decimate our anthropic GHG emission problem. I awoke this morning to read the shocking news that Mauna Loa CO2 readings are over 414ppm. Since we are 2 to 3 months before a yearly northern hemisphere peak, this is very grave as it indicates a substantial amplification of CO2 in atmosphere and hence Earth's energy imbalance. A plausible conjecture is that we are witnessing TODAY the tipping point triggering of carbon release from soils. This process has been well covered in the science and is the source of one of the central fears. The potential extent is eventually enormous. If this conjecture turns out to be the case, doing very little more wrt renewables and intentions to rein in the societal power requirement, is tantamount to a societal death wish. I think the ultimate origin of the meme "renewables are just an extension of fossil fuels" (which is nonsense in all possible interpretations of the statement) goes back to Howard Odum, who was a pioneer, but badly misunderstood photovoltaics in one of his last papers. So why speculate -- do a small scale trial of building PVs with 100% renewable energy. Mine the ores, build the factory, grow the crystals, extrude the metal bits for framing and support, make, mix and pout the concrete for the footings, etc., etc. What do you think this gentleman does not understand? Another thing that is overlooked is that all of this electrical transmission is going to keep generating waste heat. Furthermore, we wouldn't simply need to keep making the panels/turbines over and over, you have to make all the gadgets that run on electricity over and over again, too. It's extremely silly to regard any of this activity as helpful. It's only creating more waste faster. So is the Nitrogen dealio. A cow eating grass and then peeing on the grass is sustainable, perhaps. Nothing about CAFOs and nitrogen-capture machines can ever be sustainable.. it's just prolonging the broken-ness. I certainly wish this were not the case, but is! Eppur si muove! Lidia, please understand that this is not the way to carry a debate. You look in the Web to find pages that agree with your ideas and then you throw them at me. Ever heard of motivated reasoning? Yes, I could do the same and throw at you plenty of links that agree with my ideas. But that would be useless when you have already decided what's good and what's bad. And there is no evidence that Galileo ever said "Eppur si Muove"
Prof. Bardi, I don't look for these types of pages.. they find me, and when I see something that strikes me as correct on a visceral level it's hard for me to shake that notion. I simply don't think it's correct that increasingly sophisticated tech is going to get us out of a hole that has been dug by increasingly sophisticated tech. Please review, again, your own motivations, which seem to me to be rooted in what you view as being "moral": whether this or that number of people should or should not die. I say nothing about "good" or "bad": those are your judgments, not mine. I only say, based on what I see, that electric cars and other high-tech—like nitrogen-capture machines—can only be energy sinks and not energy sources. I would have been blissfully happy to remain a motoring city-dweller with a job that supported other motoring city-dwellers had I not gotten the "clue-by-four" that industrial civilization is not only unsustainable in the long term, but is on very shaky near-term ground. Finally, does it matter whether Galileo said it or not, if it's true!? Note that I did not mention anything about Galileo. Oh, and as for "motivated reasoning", I'm retired and financially beholden to no one at the moment. I don't have a boss or a dean or a publisher. Lidia, I don' know who you are and what you do. But I think you find yourself in the power of some evil ghost that has convinced you that there is no future. It is easy to convince oneself to be what others think you should be, just as it is easier to destroy than to create. Maybe they are right, maybe we are all going to die soon. But I do think it is not true -- that "they" are an evil ghost of the present that the future will dispel. There is a future for us, some kind of future that we cannot perceive so well, but a future in which we won't have to renege the spark of intelligence we have been endowed with. If we have this spark, there has to be a reason: we are called to use it for some good purpose. And I think in the end we'll succeed, we'll learn what our purpose it and we'll work for it as we are called to do. Maybe not us, but those who will come after us. Think about that. Prof. Bardi: "If we have this spark, there has to be a reason"
Does there have to be a reason? Why? What "good purposes" have we used our spark of intelligence for? Many which are temporarily pleasing to us, but also many "bad" purposes in the long run.. it's a mixed bag. You say, "in the end, we'll succeed"... Succeed at what? We've already succeeded, don't you see? >>This is what success looks like!<< All species succeed until they fail. There is no "purpose".. that is teleological. You are supposing that there is a purposeful process supporting the continued existence of humans. This is a religious belief, not a scientific one. I was trained as a biologist at a famous institution and after 5 years I "walked away" because I didn't see the point in genetic engineering or any of the other things the institution was training people to do. I fear that most engineers and physicists who study our energy and materials situation have a sketchy concept of the biological (viz. their apparent sincerity in believing that humans could colonize Mars or the Moon). There is a point where so-called "intelligence" becomes extreme stupidity. We have seen this in the nuclear arena. Just because you can do a thing, doesn't mean you should do a thing. Anyway, these sorts of issues used to frustrate me enormously, because I could not figure out *why* supposedly-smart people would buy into such destructive programmes. When I came across the MPP/MEPP theories a few years ago, a light bulb went off for me: people are doing these things not because they are the most healthful or sensible, but because they release the most energy possible. We are just catalysts.. enzymes in a reaction over which we have no control. To desire control is normal, it's human. I'm clearly in a minority in that I can exist pretty happily without needing a narrative of Human Progress, Improvement, or Agency which will not be forthcoming. Lidia, why are you so negative? I suppose you mean "MEP" for maximum entropy production. MEP is not a punishment, it is an opportunity. It is not progress, it is change, it is the way the universe works -- we are part of it, we go with the flow. Maybe the universe doesn't have a purpose, maybe it does. But we are given a chance to do something good while we are part of the flow. I am everyday in contact with young people, my students. I can't tell them that there is no future and I do believe that there is one. Don't lock yourself inside a cage and throw away the key. I am sure you can do better than that. Yes, the Maximum Power Principle and the Maximum Entropy Production/EmPower Principle. In what way are these opportunities? They are merely descriptors for how we exploit our surroundings: the bigger exploiter “wins”, at least in the short term. Since without a short term there is no long term, this translates to winning in general for as long as the conditions for exploitation hold out. Yes, indeed we "go with the flow"... but the flow, as you know, is uni-directional. What is "doing something good"? I don't think building electric cars falls into that category. By default I have personally taken up very homely low-societal-value pursuits like weaving and knitting which have the added feature of being bio-degradable. But the world, as we know, does not revolve around what spinsters do, rather around the exploits of MEPP mega-spreconi like Elon Musk, who will have destroyed far more energy in his shenanigans than could ever have been saved by simply driving around in old diesel VWs instead of his death-traps. ***That is what I mean by the light bulb going off:*** true efficiency and conservation is neither desired or rewarded, and this is not merely because of political recalcitrance—it is a Law of Nature that it be so!! You *can’t* tell your students there is no future?? I know that statement to be untrue: you *could* tell them that—you simply do not *wish* to do so. If you knew a meteor were going to hit the earth in five years, would you withold that information? Wouldn't that be a kind of malpractice? Don't people look to science for answers which are valid to the best of the scientists' knowledge? You make "being negative" seem like merely a caprice, something I perversely *choose* to do in the face of clearly superior alternatives. And again, you promote false concepts of Agency: the idea that *I* am the one with the key to lock myself up (with the truth)... instead of "doing better” by using another supposed "key" to free my mind instead to roam in a world of fantasies… the idea that we can create our own variants of physical truths (shades of Karl Rove) to support what might make us feel better. Instead, I find it extremely freeing to confront how ephemeral our lives are, how ephemeral our civilizations.. it gives me the ability to dispense with no end of previously-worrisome distractions. If you truly believe there is a semi-industrial future, which it sounds like you do, what do you think it look like? Will even 10% of current ICE vehicles be electric ones in five or ten years? If so, what would lead you to believe that? What makes you think the current electrical grids will be able to support increases in solar generation beyond the current small percentage? They can barely hold up as it is. I could continue for a long time in this vein, but I will spare any remaining readers, who I think will have gotten the gist that most things industrial are careening past their sell-by date at this point. After visiting Norway last August and learning about the trillion dollar sovereign wealth fund, government funded health care, education through university, day care and paid family leave when a child is born, it occurred to me that Norway is the only country to escape the resources curse. It really does matter how we manage a society. I looked up Angola for comparison, a country with the same order of magnitude of fossil fuel endowments as Norway. In round figures, in 1950, Norway had 3 million people and Angola had 4 million. Now Norway has 5 million people (including over half a million immigrants, mostly Somali refugees). Angola has 26 million. Birth control and family size norms matter. Accomplishing a fertility transition is the best thing a poor country can do. By the way, back when Norway was poor, over 400,000 immigrants came from Norway to America (circa 1850-1920). Angola has suffered civil war, kleptocracy and still has one of the highest infant mortality rates in the world. And, except for the few with Swiss bank accounts and power, most people are desperately poor. As I say, how we manage matters a lot. Of course, the colonial Portuguese, the South African Apartheid regimes and the oil companies and the meddling CIA bear a lot of blame for this mess. Those desperate Norwegian immigrants to America came about due to the relaxation of birth-controls in Norway at the end of the 18th century, which so alarmed Thomas Malthus -he foresaw the over-population and hardship which would result. See his travel dairies, which are fascinating. The Wealth Fund will dissolve like fairy gold. And the high energy per capita has 1/ made Norwegians much softer than they were, and 2/ burdened them with a great many useless migrants who only seek to parasitise on that energy surplus. The population has -as everywhere - also grown far beyond the carrying capacity of the land. But - ouch - Italy has many more people than Norway. That means lotsa panels. We have to work on that! Heinberg's book is excellent and, of course, there are limits to the amount of solar energy you can use without turning the earth into a shiny silicon ball. 60% may be a reasonable limit. There is nothing you can't do with the 60% of anything. Norway is far from alone in having a great many useless (im)migrants. America, a much bigger country, has many, many more. My mother was a useless immigrant from Holland. A grandmother was a useless immigrant from Germany. A great-grandmother was a useless immigrant from Scotland. All of them remember(ed)being referred to as "useless immigrants" (and worse). Fortunately, they all have/had far more in way of happy relations with most of their fellow Americans. Anonymous (2019/02/11, 11:47 AM), I congratulate you on your wisdom in remaining anonymous. David Collins and Anonymous, whatever your opposing feelings seem to be on the matter, your exchange has, for me, emphasized a disconnect long held in political and economic circles as well as in (as we see in this blog) "scientific" circles, and that is the disconnect between the ideas of consumption and production. We talk about oil "production", when what we really mean is oil consumption or oil extraction. All production is extraction/consumption. Governments are not interested in importing producers any longer, as there is no need for them.. instead they are interested in importing consumers (and voters). People in low-consumption societies are being actively shunted toward high-consumption societies (Somalis are not just spontaneously wending their way to Maine or Minnesota) in part to keep consumption from flagging. (I believe there are other motives but this is the one that concerns us in immediate energy terms). In modern political and economic terms, production is always a good thing. Consumption is also usually a good thing—we want more consumers who consume more—until it isn't. You produce a book? That's consumption. You produce a carrot, a house, an electric car? It's all consumption. The inexorable voracity of this is under-estimated. "The highest depreciating cars of all, by the way, are electric cars. They lose value even faster than luxury cars – $6,000 annually, on average according to AAA – not because of fickle things such as not being the latest things but because of functional things – aging battery packs that can’t hold as much charge as they could when new. "Which means the EV can’t go as far it could when it was new. "And because that wasn’t very far to begin with vs. a non-EV, any significant reduction in battery performance (and so of driving range) can render an EV functionally useless. Or at least, a hassle that most people aren’t interested in putting up with given how long it takes to recharge an EV. "This is why you can find three or four year old Nissan Leafs – which stickered for $30,000 when new – for $10,000 or even less on the used car market. That is a big hit to 'save on gas.'" Layer on top all the flaky software and these things will be expensive bricks in short order.. just like your Palm Pilot or pre-4G flip phone. Am I wrong in this perception? If so, how? The Tesla that Ugo stands in front of claims a best-case battery life of 5 years, after which the battery pack needs to be replaced at a cost of $10,000+. Tell me again how this is going to save lives, because I guess I am just too dense to figure it out.